Ryoichi Kurokawa, inhabits a small dark room inside the multipurpose space, full of exhibitions and often host to gigs from the like of Laraaji or Earth vs. The Bug. It’s like stumbling across the bridge of an abandoned spacecraft amid ancient Roman ruins, swapping out blazing sun and warm paving stones for a psychedelic strip of striking futurist sight and sound. Seven screens lie face-up in a row in the middle of the floor, cresting one-by-one through a see-saw wave – only the central screen is lying entirely flat; the first and last sit at opposing 45 degree angles. While the seven large and long screens flicker and flutter with teeming swarms of data, visualised as abstract lines, shapes, and visual static, four speaker channels crackle and boom in kind from each corner of the room. The source material comprises a variety of data, images, and code provided by scientists from the International Iberian Nanotechnology Laboratory (INL). “It’s a unique collaboration between art and science,” explains Kurokawa. The abilities of nanotechnology to look at the world in such minute detail doesn’t just have scientific implications. This is where the umbrella project under which Kurokawa’s ad/ab Atom installation falls gets its name: ‘Scale Travels’. While there’s a huge disparity between the layman’s understanding of nanoscience and the complexities of Kurokawa’s processes – of the ins and outs of reinterpreting data and code as visualisations and electronic thuds, bleeps, and buzzes – the effective properties of nanoscale systems are unmistakably potent. It’s a dizzying experience being confronted by the nanotechnology inside the space, particularly when filtered through the countless possible visualisations and sonifications of digital processes wielded by Kurokawa. A lattice of monochrome networks across the screens, resembling something between neural pathways, cosmic star maps, or aerial views of busy traffic. The screens constantly appear as if glitching, while the images and punctuating sounds shift and mutate too fast to follow without anything other than the deepest concentration. There’s no discernible narrative to what’s going on on the array of abstract electronic displays – although a countdown timer drops down semi-threateningly across all seven screens throughout each looped performance. Kurokawa created the imagery and animations through a mixture of contrasting processes. He digitally reconfigured code provided by INL scientists into a series of 2D and 3D images. 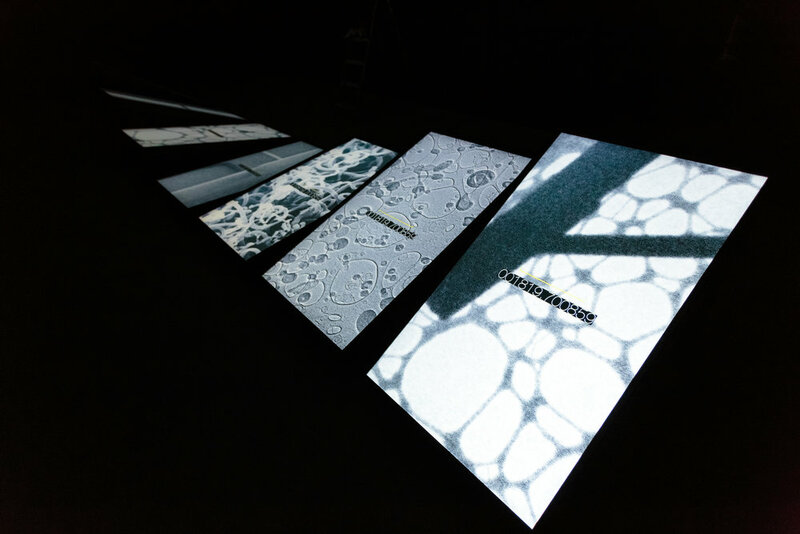 In contrast, Kurokawa also took images taken using INL’s electron microscopes and analysed them to find nanostructures, which were then reinterpreted to form new processes giving shape to the motion of the visuals. Kurokawa is clear that the laws of physics, and thus the laws of nature, form the basis of his work. It’s all just a matter of perspective – or perhaps more aptly, a matter of scale. Joaquín Fernández-Rossier is currently the leader of the Group of Theory of Quantum Nanostructures.